I know it’s been a while and for that I apologize the last few months have been pretty crazy around here…although I’m starting to see a trend with life in general lately, namely that it’s always crazy. Name: There has a been a name for the editor ever since I started working on it. I wasn’t sure if I was going to think up something really cool and change, or leave it. Turns out I just left it. 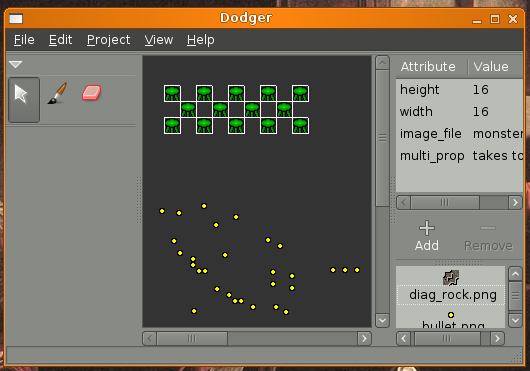 So from this point forward this project is christened: “Dodger”, or probably more correctly: “Dodger Level Editor”. The name has its roots in the name of one of my cats and a history in the multitudes of level editors and game engines that I have tried to create in the past, but I wont’ go into that. So Dodger it is. 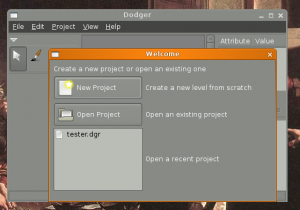 Welcome Dialog: This was a real pain, but it’s made the last while so much easier. I added a working (at least I hope) welcome dialog with a way to create new projects, open old ones, and a recent file list. The recent file list really makes testing easier for me. 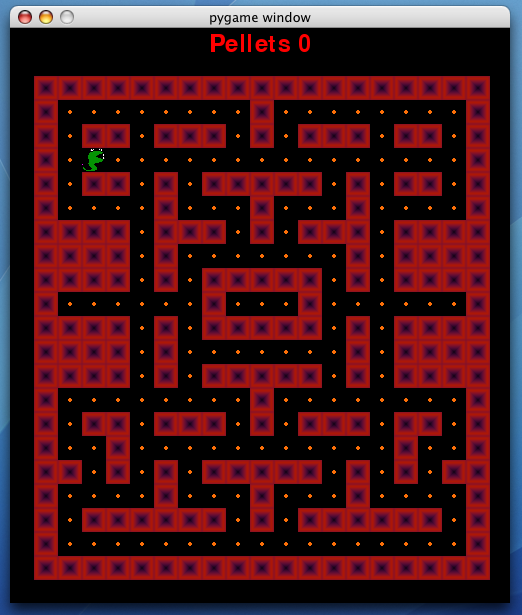 Rect tracking: Rect tracking is finally working properly. I’ve had the rect tracker in there for a while but it didn’t really do anything until now. Multiple Selection/Multiple Properties: I’ve also finally got multiple selection going, which is what makes the rect tracker actually useful. 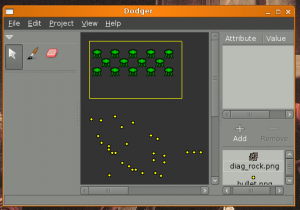 You can select multiple sprties, move them around and add properties to all of them. Remove Properties: Now you can remove custom properties that you have added. This was a must but I was lazy and left it for a while. Steps towards being made public: A lot of the changes (and I do mean a lot) that I’ve been making have been behind the scenes. There has been a lot of refactoring and reorganizing of the code, often the result of quick and dirty implementations that I made earlier (sigh). 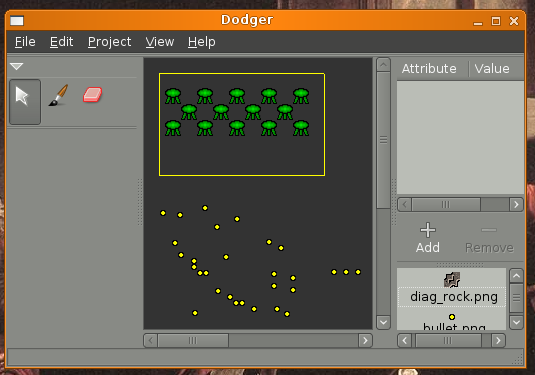 I’ve also started working on getting the distribution of this editor going so that other people can use/develop it. I’ve added support for zc.Buildout so that if anyone wants to develop they can quickly gather dependencies and won’t have to install the editor system wide, not that you have to anyways but zc.Buildout is really neat. I’ve also worked on the license (GPLv3) and setup.py and README and all of that. None of it’s done but it’s working its way forward. Faster: It’s also much faster now. None of you have used it so you’ll probably think it’s slow, but trust me it’s much faster then it was before. changes made to pyglet. Not pyglets fault but it took a long time to figure out what the issue was. Google Code: The project has a temporary homepage over at google code: http://code.google.com/p/dodger-editor/ There’s nothing there yet but over time I will start to host the project there so that people can easily download it. I’ll still post updates here until the site has a full-time home. I’m going to use Mercurial for the revision control system for the project so the CVS support at the google code site will just be for downloading. Eventually I will want to host the project on some space of my own and get a nice web interface for the mercurial repository going. I’ll have to find a new hosting company so it will take a while. So that’s it, that’s what’s happened to the Dodger Level Editor over the last few months. I know I promised to make it public earlier but given the shape it was in at that time there really was no point. I want this to be at a point where people can actually almost use it before I make it public. I know it’s been a while, and I know the few of you that actually care about this project have probably moved onto bigger and better things, but hopefully if you stick with me there will be something out soon. This is a quick post on how to use menu’s in Tkinter, if you are unfamiliar with Tkinter you might want to check out some of my other Tkinter related posts. What this gives us is basically a plain old blank Tkinter window, not too exciting. The next thing we are going to do is add create our root menu, before going any further you might want to read the excellent information about menu widgets in PythonWare’s Tkinter introduction. You don’t have to but it’s an excellent source of information. Up until now we’ve focused on python applications that only run in the command line. For a lot of tasks this is great, but in order to be really impressive we’re going to want to create a GUI for some of our python applications. There are a lot of python GUI toolkits out there, but for our first application we are going to use Tkinter, which is considered somewhat of a standard right now and is installed when pyhon is installed. Another nice thing about the Tkinter GUI is that it is cross platform and offers a native look and feel on *nix, Windows, and OS X. Please remember to read part one and part two. All right, now that we have split our RSS reader up into functions, we’re going to go one step further and put our code into a class. We’re also going to do something a bit more advanced with our class and create a generator. The reason that we are going to do this is because python has such nice iteration handling and because in the future we’ll probably want to handle each RSS item individually rather then simply dumping it out to the terminal. Generators are basically a type of iterator, except their syntax is slightly different. In fact anything you can accomplish in a generator you can accomplish in a standard iterator. This post is my continuation of my Python based RSS reader that I wrote in part one. As I said the code written in part one is not something that you would ever really want to use or maintain since it wasn’t broken up in to functions properly. So, in this part we’re going to work on breaking the old script up into functions. All right so I’ve already figured out how to write an executable script that writes out “Hello World!” to the command line, now I need to figure out how to do something interesting. As a result I was surfing the Internet and reading some Python documentation, trying to come up with something to do but nothing seemed interesting enough or easy enough for me to do until I visited one of my favorite websites: slashdot.org. Well after reading the python documentation for a few days I decided it was time for me to write my first real script. Now I’ve written a few scripts before in the python interpreter, but I wanted to try my hand at creating some stand-alone executable file. Now I didn’t want to go too crazy with my first script so I thought I would start off with the simplest program that everyone knows, the Hello World program. For this example I’m going to use the gedit since I already have it installed and it comes with built-in python syntax highlighting, but any standard or fancy text editor could be used in its place.